Join us for the Villapesupinnat KAL! 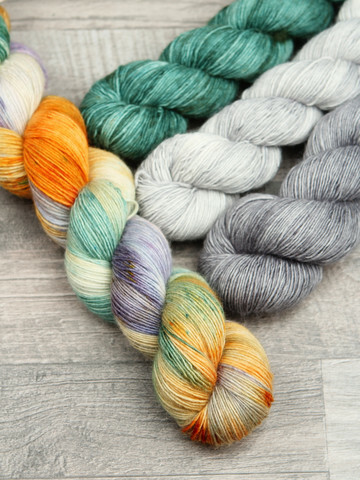 This combo package includes the Yellows: the medium grey Platina (Platinum) is combined with a light grey Hopea (Silver), along with the light teal PInja (Pinus) and the lovely new shade, speckled with lilac, yellow and teal and developed just for this KAL, called Elämänlanka (Morning Glory). You will receive 1 skein in each color: 4 skeins and 400 grams total. The yarn chosen for this KAL is our delightful superwash merino single Luonnotar. These colors have been specially hand-picked for the Villapesupinnat Shawl KAL! These combos are priced for pre-KAL only! Please note that all packages will be dyed to order and shipped on April 27th in time for the pattern and KAL start. Customers outside of Finland: Your yarns will ship out on April 27th. Delivery times will vary.